Did Cinderella have it all wrong? This Double-Layer Pumpkin Pie proves the pumpkin is better than the prince! 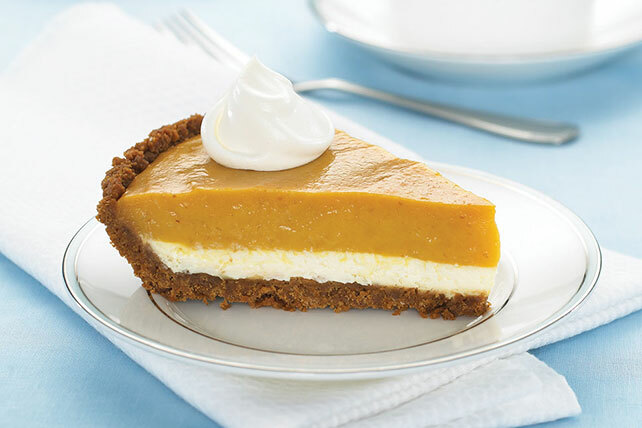 Enjoy this creamy Double-Layer Pumpkin Pie. Beat cream cheese, sugar and 1 Tbsp. milk in large bowl with whisk until blended. Stir in half the COOL WHIP. Spread onto bottom of crust. Whisk pumpkin, dry pudding mixes, spices and remaining milk in medium bowl 2 min. (Mixture will be thick.) Spread over cream cheese layer. Prepare using PHILADELPHIA Neufchatel Cheese, fat-free milk, COOL WHIP LITE Whipped Topping and a 6-oz. ready-to-use reduced-fat graham cracker crumb crust. Be sure to use canned 100% pure pumpkin, not the canned pumpkin pie mix. Prepare as directed, stirring in 1/4 cup chopped toasted PLANTERS Pecans along with the COOL WHIP. Serve with brewed MAXWELL HOUSE Coffee. For an extra-special toffee flavor, stir 1 Tbsp. each chocolate syrup and caramel ice cream topping into each 6-oz. cup of hot coffee until blended; top with a dollop of thawed COOL WHIP Whipped Topping. Prepare using 1 pkg. (3.4 oz.) JELL-O SIMPLY GOOD Vanilla Bean Flavor Pudding.